A date has been set! A route has been made! 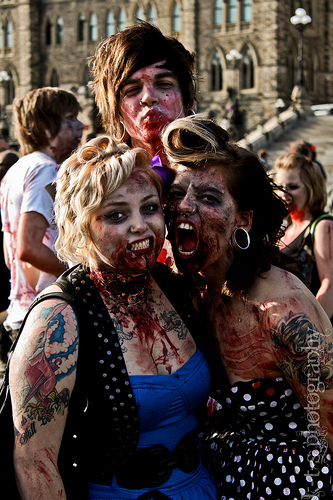 Get ready all you shamblers, because this years Ottawa ZombieWalk is going to be bigger and better than ever before. This years walk is being held October 22nd at 3PM. The route starts this year at MacDonald Gardens Park, just off Coburg St. - get there at 1:30 for official ZombieWalk photos. The route will then wend it's way down St. Patrick, through the Byward Market, and up Elgin St., before ending at Parliament Hill around 5PM. We of course will be there to bring it all to you, but hey, don't witness second hand - come on down and join the fun! You can get all the details at the Official Facebook Event, and at the Ottawa ZombieWalk Site.